It was Monday night, well, Tuesday. It was Tuesday, and the familiar aroma of freshly gigged stingray had overcome the spare fridge. The plan was to wake up for sunrise, the alarm set for 3pm, should an over snoozing occur. It did. Rolling over around noon. OK, prefishing for more bait is out, as there was still the matter of respooling and resplicing the Tiagra 80, on which the topshot had just been shredded in a rocky situation and a Lemon shark during the previous outing. Fast forward several procrastinated hours before all was said and done. Of course this is just part of what it means to be a shark fisherman. Excluding all of the rig making, car packing, scouting, and bouts of continuous failure that drive one to the brink of insanity. A full time job, even when it’s just for fun. This time the journey was longer, yet the conditions were perfect. Calm seas, light crowds, no bugs. Predatory fish slicing through small bait at dusk spiked my level of excitement. Like clockwork, the boats made their way towards the inlets to which they belonged. A large slab of stingray was rigged, and kayaked far into the starlit ocean, where it was lowered into the depths, swallowed by darkness. 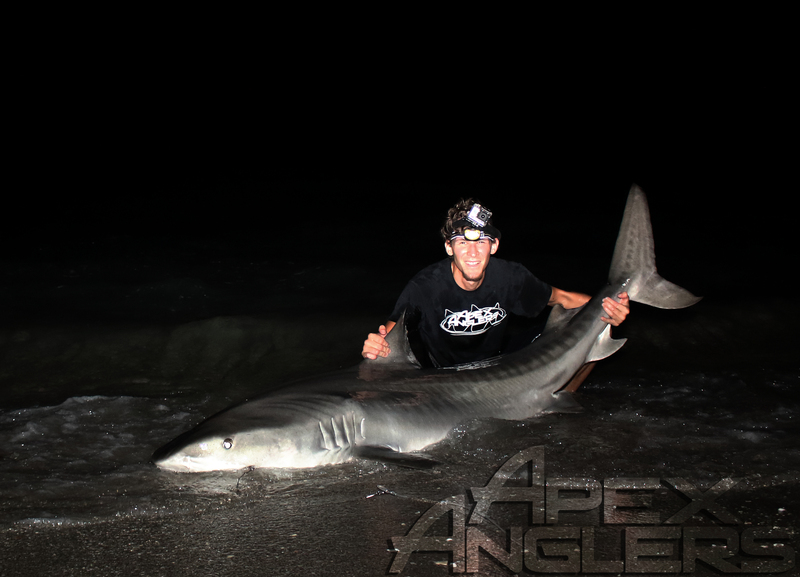 Midnight – Several hours had past, a 50 inch Blacktip had come and gone. Gear was slowly migrating towards the car… Only a few items left to pack up. Not a soul left on the beach in either direction. The ocean dead where it stood, slack. Or so it seemed… I didn’t see the fish that was cautiously inspecting my offering. Click… Bounce… Click…. Click… Zzzzzzzzzzz… PAUSE. Nothing. The breakaway had done it’s job. The bait now floating freely. A half hour tug of war ensues before the leader is visible. The rod is spiked, and the silence is broken by my own voice, repeatedly, “oh my god, oh my god, oh my god.” A makeshift tripod had been at the ready for this very moment, the timer was set, and into the ocean I went, where it was just me and her. Afterwards, we went for a walk, neck deep into the aquatic abyss. It is a risk, but it is a responsibility. We parted ways, both to return to our lives just as they were before. The beach left clean, free of any indication anything had ever happened there. This is what defines shark fishing for me, a special moment between you and natures biggest predators, frozen in time.